Famous for preparing his own racing cars, Carlo Facetti started his driving career in 1953, when he was just 18 years old. Although he tried to qualify for a Formula 1 race once, he was more successful in GT racers and touring cars. By the mid-1970s, he was even briefly employed by Lancia to help develop a 24-valve engine for the Stratos rally, which he would race himself. In 1976, he won the Giro d'Italia in a silhouette version of the Stratos. After leaving Lancia, he turned his attention to the recently introduced Ferrari 308 GTB. He was one of the first preparers to see the car's potential and converted several to Group 4 specification. Much of the work focused on the engine, which was carefully modified to produce an impressive 320 bhp while still meeting the strict homologation requirements. The next objective was to lighten the car and eventually the Facetti modified 308s tipped the scales at just 1,055kg. Although not raced until halfway through the 1977 season, the Facetti 308s were all based on the very first fibreglass bodied cars, which were built only from 1975 through to the end of 1976. Accordingly, each of the Group 4 cars was derived from an existing car that had previously been used on the road. The first major appearance of Facetti's Group 4 308 GTB was at the 1977 Giro d'Italia with owner Felice Besenzoni behind the wheel. He later also raced the car in the 1978 Daytona 24 Hours where a pair of Facetti 308s lined up. 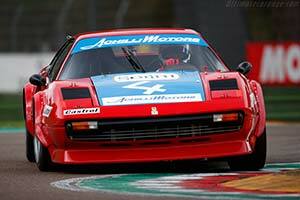 Most successful of all was Facetti himself, who raced one of the the 308s to the 1978 Italian Group 4 GT Championship, scoring four outright victories along the way. After the 1978 season, Facetti continued the development of the 308 GTB and with the financial backing of Martino Finotto eventually created a Group 5 version that featured a turbocharged version of the V8 engine. Facetti and Finotto later also built their very own engine that would power a Group C car they fittingly also raced together. Although largely forgotten and usually overshadowed by the better known Michelotto Group 4 version of the 308 GTB, the Facetti built and raced cars fit perfectly in the long range of successful cars campaigned by the remarkable Italian engineer and driver.